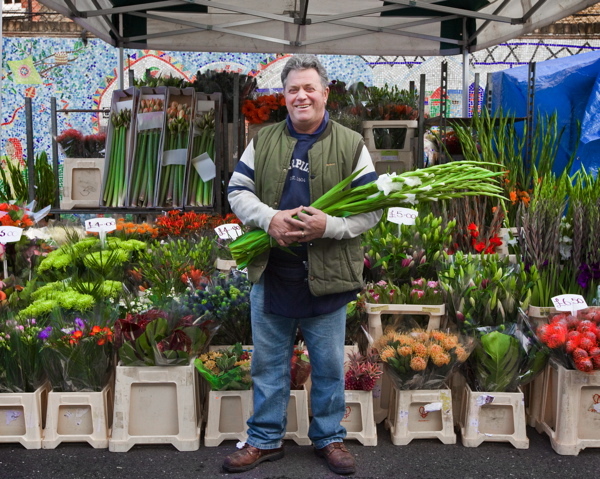 Dawn had not yet broken at six this morning when I rose in the dark to walk up the road to have a chat with Denis Madden, one of the most spirited traders in the Columbia Road Market. When I arrived at six thirty, he was already set up and bright with anticipation for the day’s trading. Denis had been up since three-thirty this morning, driving from Hertfordshire. “I shall be tired come four thirty this afternoon,” he admitted with a shrug,” You’ll see it in my eyes.” And he gestured to his eyes enacted a cartoon version of sleepiness. I admire his stamina, because this pitch in Columbia Rd is just a third of his business. Yesterday, Denis was trading, as he does every Saturday, in Saffron Walden, and on Friday in Uppingham in Rutland – and he spends two days each week prepping back in Hertfordshire. Yet Denis is full of magnanimous humour and energy, steeling himself for another winter on Columbia Rd. “You learn to tolerate the cold, you accept the bad weather in Winter just as you accept the good weather in Summer. The only real problem comes with the flowers when the water freezes, some don’t like getting frozen and defrosted again.” he explained in characteristically practical terms. After forty years trading here, Denis takes all it in his stride now. “I’ve already retired once, packed it up and moved to France but I found I kept coming back to sort things out…” Denis confessed to me, rolling his eyes with an absurd grin of self-parody and spreading his hands as if to say, “What can I do?” The market is his life and he is not going to give it up any day soon. Wow, Denis and the other stall-holders are so admirable for battling against the weather. I just spent 2 hours wandering around a Car Boot Sale and ran home in desperate need of a cuppa to defrost me!